Fire Claim or Other Claim Denied or Delayed? One of the most devastating events is destruction of property by a disaster such as fire, flood, or storm. When an insurance claim is denied, delayed, or underpaid this is a life altering event for a policyholder. But for an insurer, it is routine business. One thing is certain, in today’s age of processing claims, “Deny, Delay, Do Not Pay.” is a common saying in the insurance industry. Insurance claims are a negotiation process and policyholders must approach the adjustment and settlement of their property insurance claim as they would any other business transaction involving a large investment. Many consumers, and even attorneys who practice in this area, do not understand many of the legal terms of the policy of insurance. Few business owners and homeowners understand that taking legal action regarding their insurance claim is an option. Fortunately, there is help. Property and business owners can turn to the attorneys at Harris Law to understand their policies, appear at examinations under oath, maximize claims, and litigate when necessary. Further, there may be other “complicating factors” involved in your loss such as a bankruptcy, pre–foreclosure, foreclosure, separation, divorce, death, arson, etc. Special attention to the file and claims settlement and possible litigation must be observed in those situations. Our staff has the experience and knowledge to handle a loss in any situation. These are things you need to be made aware of in your insurance policy. Types of coverage, hidden extensions of coverage, limitations of coverage, deadlines to file paperwork, total loss methods of payouts on your claim, etc. The Law Offices of Jason E. Harris has the knowledge needed for your benefit. If your home or business has suffered damage, contact us today. We handle most of our cases on a contingency fee basis. This means that we are only paid attorney’s fees if and when we obtain money for you. If we don’t recover any money for you, you don’t pay us anything. Please contact us for a FREE consultation! Want to see what our clients are saying about Harris Law? Click here for testimonials. Or browse our successful cases by clicking here for case studies. When a fire occurs, questions become overwhelming. Property owners and business owners are confronted with salesman, public adjusters, paperwork, requests for proof of loses, demands for inventory and more. Most individuals believe that their insurance company will be there to handle everything — not exactly. The insurance adjusters work for the insurance company with a view to protecting their employer, the insurance company. Unfortunately, help is often too little, too late. Insurance policies are complex, and policyholders often do not understand their policy’s benefits and obligations. The insurance industry has achieved billions of dollars in record profits by systematically denying and underpaying claims. The attorneys at the Law Offices of Jason E. Harris will level the playing field. We have one goal in mind – to protect our clients’ financial interest. We will assist you in understanding your rights and guide you through the claims handling process and, where necessary, file suit to recover all financial damages owed to you from your fire loss. We will document your fire loss, determine the value of your smoke and fire damages, and streamline your claim with your insurance carrier. From assessing property damage to handling a complex business interruption claims, to appearing with you at examinations under oath, to filing suit, we have the knowledge and skills to help you recover the full amount that you are owed. We are experienced in navigating complex insurance policies and will work to resolve your fire damage insurance claim to achieve prompt compensation for damage to your property by your insurance company. If your home or business has suffered fire damage, contact Law Offices of Jason E. Harris today. Smoke damage resulting from a fire can kill. It can be as devastating as the fire itself. 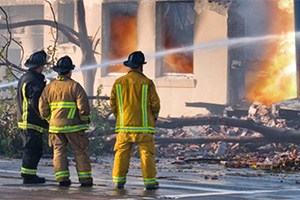 If your home or business property has been affected by a fire, it is urgent that you know exactly what damage is covered by your insurance policy. The Law Offices of Jason E. Harris can guide you through every phase of the entire process to ensure that your smoke damage claim has been paid in full and your property is restored. 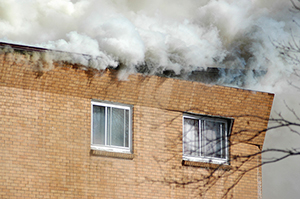 We are experienced in navigating complex insurance policies and will work to resolve your smoke damage insurance claim to achieve prompt compensation for damage to your property. Dealing with water and flood damage at your property is a messy enough situation. If you’ve never experienced this type of disaster, the task can be overwhelming and daunting as you will be staring at a million details needing your focus and attention simultaneously. Illinois suffers from more than its fair share of storms. A broken pipe, localized flooding or a rising creek is more than enough to spell disaster for a family or business. When the rains stop and the flood recedes, you may be left with a flooded car, ruined home or destroyed business. In the worst cases, you may have no place to live and find yourself at the mercy of strangers. The process of rebuilding and replacing ought to begin as soon as possible. But, for some, the flood of water is just the beginning of a flood of a different kind. You may find yourself flooded with denials, excuses and demands for detailed inventories that no reasonable person would keep. There are cases where insurance company engineers wrongfully file reports stating there was no structural damage when in fact there was. When an insurance company delays payments, refuses claims, or sends their handpicked “experts” to tell you why your claim is without merit, you may need the help of an attorney who specializes in this area. Our experienced and dedicated staff will not only assess the damage from the flood, but will also determine the full damage from the hidden water, mold, mildew and fungus that your insurance company may have overlooked. We are experienced in navigating complex insurance policies and will work to resolve your insurance claim to achieve prompt compensation for damage to your property by your insurance company. Snow and ice accumulation is a big problem in the Chicagoland area. The accumulated weight of several snow and ice storms in a single season often threatens roofs throughout the region. Ice damming is a covered claim but is often denied. As roofs weaken and collapse, homeowners and business owners are seeking coverage for their losses under their insurance property policies. Some insurance company policies contain language that either excludes or limits coverage for damage caused by weight of ice and snow. Allow us to review your policy and the facts of your case to determine if you are entitled to more benefits under your policy. Collapse claims present a variety of challenges to the loss adjustment process. 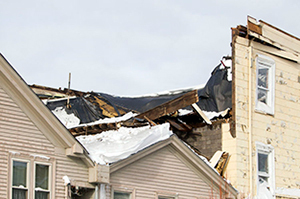 Besides issues of coverage, collapse claims are extremely time sensitive because of the inherent danger of unstable buildings and the risk of further damage to covered property. Insurance companies know all the tricks – you need someone on your side who knows all about these tricks and how to beat them. Your home or business has been devastatingly damaged by a tornado. In a matter of seconds, your life has been turned upside down and of course your first instinct is to call your insurance company — it makes sense! It is after all, your most important life investment. Unfortunately, insurance policies are complex and policy holders may not always understand their policy’s benefits and obligations. 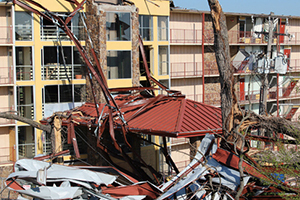 Tornado damage is often total and complete. At the Law Offices of Jason E. Harris, we are total-loss insurance litigation firm. We stand up for policyholders to take action against insurance companies that operate in bad faith by denying the full cost of building replacement and property repair after a loss such as tornado. If you have experienced any of the following after submitting a tornado damage claim, contact us today. The Law in Illinois is clear and specific. Insurance companies are required to show reasonable cause for denying or delaying payment. If your claim has been denied or held up for unknown administrative purposes, we will be your advocate and voice to get the claim resolved. We retain experts such as independent roofers, contractors, and engineers to determine the damage and the source. 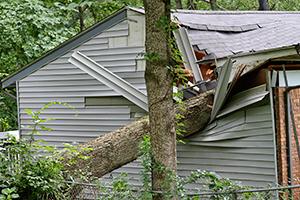 When we handle property insurance claims, we don’t just take the estimates provided by insurance adjusters. We actively investigate opinions from contractors and independent adjusters and do an independent evaluation. We get a very detailed comprehensive estimate on the real damage and how much we should seek in claim compensation. Our use of professional experts, contractors, and engineers sets us apart from other insurance litigation firms. 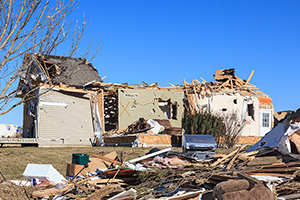 Our staff and attorneys will review your case and determine the best course of action to ensure that your tornado damage claim is paid in full and that your property is restored to a pre–catastrophic condition or better. We are experienced in navigating complex insurance policies and will work to resolve your insurance claim to achieve prompt compensation for damage to your property by your insurance company. Plumbing damage, like any other damage to a property, can be disruptively stressful and overwhelming. You first thought is to contact your insurance carrier. Absolutely correct, because your policy requires that you provide immediate notice of loss to your insurance agent. Your second thought is to wait for follow up from your insurance company’s claims department to assess your loss and how they and you will proceed next. The terms of your policy will determine if the water loss is covered. For example, insurance policies specifically exclude natural flood waters. Some policies allow for claims from flood waters with the proper endorsement. Seepage is usually not covered. Pipe bursts from freezing pipes is covered. However, insurance companies may position themselves to deny such a claim by arguing the property owner did not maintain proper heat. 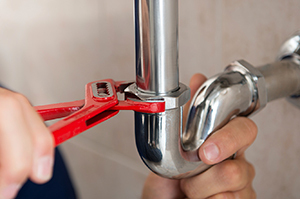 The Law Offices of Jason E. Harris are experienced in navigating complex insurance policies and will work to resolve your plumbing damage insurance claim to achieve prompt compensation for damage to your property by your insurance company. It can be pretty unsettling to come home and find that your place has been ransacked by a burglar. And while the incident may come as a shock, you are, in fact, not alone in your troubles. There were more than 2.1 million burglaries across the United States in 2012, according to the FBI. The Law Offices of Jason E. Harris are here to help. 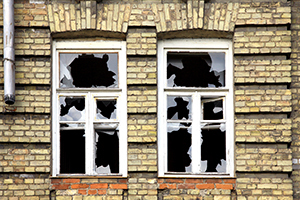 Many innocent homeowners and business owners have been victims of theft and vandalism. Some insurance policies cover damage for vandalism, but not for theft. Portions of the policy call can cause a claim not to be paid if the property is vacant for a certain amount of time. With the recent increased value of some metals, such as copper, coupled with a struggling economy, many insurance companies have tried to claim “theft” in an effort to avoid paying for validly covered vandalism damage. Whether it’s for your home or business, we want to make sure your insurance claim is filed quickly and correctly and that you get paid fairly under your policy. It is common for insurance companies to deny vandalism and theft claims, saying the damage is not covered or you have not provided enough documentation to substantiate your loss. In some cases, the insurance company has no basis for its decision and that is when you need a law firm. The Law Offices of Jason E. Harris on your side to fight for you. It is important to identify the extent of the damage and what actions need to be taken to bring your property back to normal as soon as possible. We are experienced in navigating complex insurance policies and will work to resolve your vandalism or theft insurance claim to achieve prompt compensation for damage to your property by your insurance company. When a disaster has interrupted business to the point where business value has decreased or the doors are closed completely, you need to carry out a business valuation. Interestingly some of the best court cases discussing proper business valuation are not for property damage cases but other types of losses. Situations for business valuations and the methods used can come up in other types of cases and are helpful in our research. The attorneys at the Law Offices of Jason E. Harris are experienced in navigating complex insurance policies and will work to resolve your commercial insurance claims to achieve prompt compensation for damage to your property. 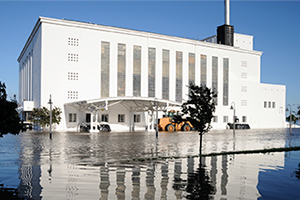 Property owners often insure their property against losses due to natural disasters. Some policies specifically exclude some natural disasters such as earthquakes or floods. If you are a property owner and you have an insurance policy question, we welcome the opportunity to assist you.